At Resilient Asset Management, without exception, the very first area addressed with all Clients is Estate Planning. Simply put, nearly every adult needs a Will. For most, there are many more requirements. Given the importance of the issue, we wanted to discuss a few issues to consider when addressing your own Estate Planning needs. Neither Christopher Flis nor any other person affiliated with Resilient Asset Management is an attorney or provides legal advice. The information contained within this article is for informational purposes only and under no conditions should anything within the article be construed as legal advice or supersede the advice of your own licensed attorney. Hopefully, this article will promote your consideration of your own Estate Planning needs inspire you to seek out a licensed attorney to execute your own Estate Planning documents. According to a survey by caring.com, nearly 6 in 10 adults (those over 18) have not executed Estate Planning documents. Fortunately, 81% of those over 72 and 58% of those aged 53-71 do have executed documents. Sadly, these numbers also tell us the majority of younger adults - generously, I will define "younger" as those less than 50 - are walking around without executed Estate Documents. By any objective standard, this is not good, thus the emphasis Resilient Asset Management places on this area with Clients. Administrator. The one appointed by the Probate Court to manage the probate estate where no executor has been designated, or where the designated executor is unable or unwilling to serve. Advance Medical Directive. The legal instrument in which a person nominates another to make medical decisions when one is unable to do so. The Advance Medical Directive includes both a “living will” and a “durable power of attorney for health care decisions”. Attorney-In-Fact. The person appointed under a Power of Attorney to conduct the affairs and deal with the property of another. Beneficiary. The person named in a Will or Trust to receive property from the maker of the Will or Trust. Executor (male)/Executrix (female). The one nominated in a Will and thereafter appointed by the Probate Court to manage and distribute a decedent’s estate in accordance with the terms of the Will. Fiduciary Responsibility. A serious responsibility of trust imposed upon one by the law, requiring the utmost degree of integrity and prudence in dealing with the property entrusted to the fiduciary (e.g. Trustee, Administrator, Executor, Guardian, Conservator, Agent). Guardianship. Court proceeding initiated to supervise management of the personal affairs of a minor or an incapacitated person. Heir. A person who will inherit your property if you die with no valid Will in effect. Intestate. Dying without a Will. Power-of-Attorney. A legal instrument whereby one appoints and empowers another person as agent to deal with one’s property and affairs. Probate. The process established in all fifty states to supervise the transfer of legal title to property from a decedent to his heirs or beneficiaries. Will. The legal instrument traditionally used to direct disposition of one’s property after death. Now that we have covered some terms, I will discuss a few of the more common documents and some things to consider for each. We have all heard the term and are now familiar with the definition. A few points to consider for your Will. One of the more difficult decisions is choosing an Executor. Being an Executor is both difficult and time consuming. Moreover, an Executor has a Fiduciary responsibility, which significantly raises the stakes for the task. And finally, consider that if you choose an individual with whom you are very close, that person will not only be mourning your death after your passing, he/she will also have a very significant administrative and financial burden in settling your affairs. So choose wisely and if you are in doubt, discuss some options with your attorney for Executor duties for your Estate. Another difficult decision is naming a Guardian for your children. If both parents are still alive, typically the surviving parent becomes a single parent, easy. Even if both parents are living, they will still want to name a Guardian in the case of a dual demise. For single parents, this is a very big choice obviously. I suggest discussing this responsibility with whom you are considering...it is obviously a very big deal to be responsible for raising a child. There are other matters to address in your Will I will not list here. Make sure to ask your Attorney if you have specific questions about what you can and cannot dictate in a Will. This document allows a person you name to manage your affairs...there are many types of these. With a General Power of Attorney, the person you name - your agent - can manage your affairs at any time. With a Durable Power of Attorney, if you are unable - for whatever reason - to manage your affairs, then the agent can step in and serve. A Durable Power of Attorney may require a proof of incapacity, which is a separate matter I will not discuss further. This is an area of special consideration for deploying Military Members with families. If you are away, you will likely want to ensure your spouse can conduct the necessary affairs to take care of your family. One important note about Powers of Attorney is they cease to have any effect once the person giving the Power of Attorney passes away. This document specifies your wishes should you enter a terminable medical condition. These documents are typically pretty short; however, you do have to consider some pretty weighty issues like ceasing medical treatment in certain circumstances, so you will want to give them some thought. Remember, this is a document your loved ones are going to reference when you are alive but they can no longer communicate with you...so make sure it says what you want without a required explanation. This document assigns a health care Agent to carry out your wishes in your Living Will and to direct your overall medical care. For married people, this is typically the spouse. For others, you will have to again choose wisely as this too is a task with great responsibility. It is probably a good idea to notify the individual you have selected and to review your wishes with them. One very important note - and a key takeaway from this article - is for parents of Adult Children still at home. In most states, when Children reach age 18, they are adults. Therefore, they will need their own Health Care Power of Attorney and Living Will. Please discuss this matter with your attorney in your Estate Planning discussions - I can only imagine the commotion involved when medical personnel are not granting you the access you want to your 18 year old child at the hospital because you do not have the proper documentation. "PREAMBLE: This is a MILITARY TESTAMENTARY INSTRUMENT prepared pursuant to Title 10 United States Code, Section 1044d, and executed by a person authorized to receive legal assistance from the military services. Federal Law exempts this document from any requirement of form, formality, or recording that is prescribed for testamentary instruments under the laws of a state, the District of Columbia, or a territory, commonwealth or possession of the United States. Federal Law specifies that this document shall be given the same legal effect as a testamentary instrument prepared and executed in accordance with the laws of the jurisdiction in which it is presented for probate. It shall remain valid unless and until the Testator revokes it." For Active Duty Military Members, you should have full confidence that the documents your RSLO prepares are indeed valid. Moreover, you should utilize these services as they are provided free of charge. Person Designated to Direct Disposition (PADD). If you pass away, this is the person to whom the military will turn for decisions regarding how you are laid to rest. Obviously, this is a huge responsibility. Therefore, this is an area of considerable frustration, particularly if a former spouse is still named after a divorce. So please make sure to review your elections at least yearly to ensure accuracy. Death Gratuity Beneficiary. This is the person (or persons) to whom the $100,000 payment will go upon an Active Duty Service Members passing. To reiterate, these elections cannot be superseded by any of the above documents (i.e. A Will), so please review your elections to make sure they are accurate. Fortunately, the military has digitized this process, so updating these elections has never been easier. SGLI Beneficiary Designation. For those who have retained coverage under the Servicemembers Group Life Insurance program, you will have to designate a beneficiary to receive the benefit upon your passing. Please review your Beneficiary Designation annually to ensure accuracy. 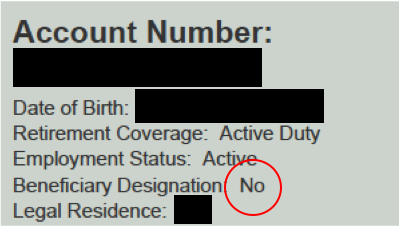 We want this to say Yes obviously, so if you are a No, you can update your Beneficiary Designation on-line via your TSP Account or via TSP Form 3. This article is by no means an exhaustive discussion on Estate Planning. 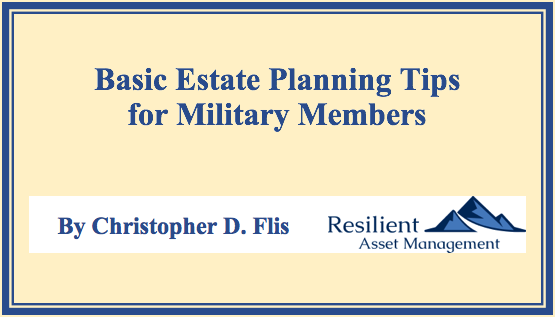 Rather, the intent is to make Active Duty Military Members and others aware of some of the critical issues involved with Estate Planning. For me, my Estate Plan is constantly evolving as my life circumstances change....children grow up, residences change, viewpoints on Executors change...the list goes on and on. Therefore, it is essential to periodically re-visit your Estate Plan to ensure it reflects what your wishes are. Remember, we can't ask you what you meant after the fact. In closing, if you don't have a Will, get one!! !